The inauguration featured speeches from Wendell Pritchett, provost of the University of Pennsylvania and former law professor to Sparks; John Oleske, senior enforcement counsel to the Office of the Attorney General of the State of New York; and Michael Fitts, president of Tulane University and former dean of the University of Pennsylvania Law School. Board of Trustees Chair Rachel Warren speaks at the inauguration. Photo by Wentao Zhang (ChE ’19). The inauguration of Laura Sparks was, in many ways, a day of fellowship. Despite a flurry of speeches from various backgrounds, considerable similarities were evident in several speeches. For instance, Fitts’ father-in-law graduated from Cooper Union in the 1930s with a degree in chemical engineering, Warren’s father graduated from Cooper Union in the 1950s with a degree in electrical engineering, and even Sparks’ first cousin once removed was a graduate of Cooper Union in the 1960s. Photo by Wentao Zhang (ChE ’19). Another recurring commonality through each speech was the story of how Cooper Union changed the fates of several people. Fitts’ father-in-law went from struggling immigrant to revolutionizing the treatment of infants in the early 20th century, Jean Brownhill went from humble upbringings to starting her own business, and Stephen Welby went from an inquisitive child of two immigrants to assistant secretary of defense under the Obama administration. Behind the allure of inauguration day, however, lay the true struggle of restoring Cooper Union to full tuition. 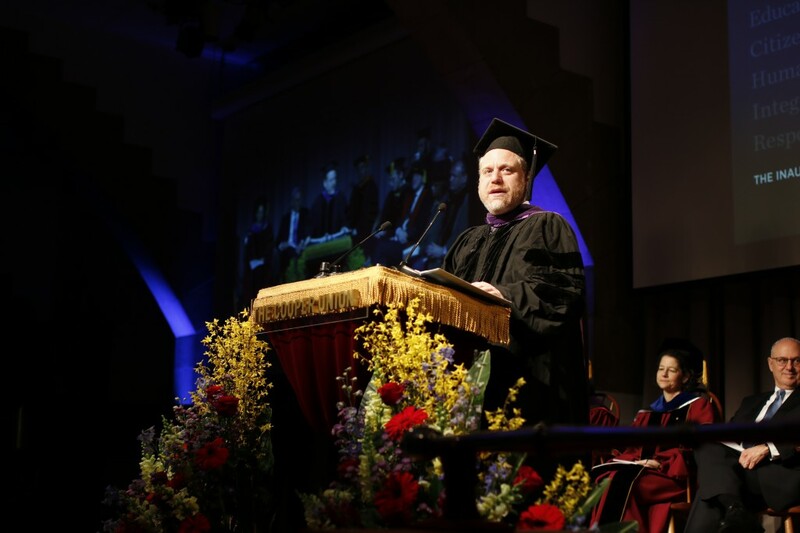 Kevin Slavin, trustee of the Cooper Union was sued by fellow Cooper alumnus, classmate, and plaintiff, Mike Essl, dean of the school of art regarding the decision to charge tuition. The lawsuit divided two long-time friends, but the inauguration brought them together. They shared a good laugh over the past, and, although the celebration of inauguration day eclipsed these struggles, they were not forgotten, especially by John Oleske. Oleske’s speech was grounded, pragmatic, and forthright. Rather than speak about Sparks’ education, leadership prowess, or financial acumen, Oleske reminded us that Sparks is, at the end of the day, a person. 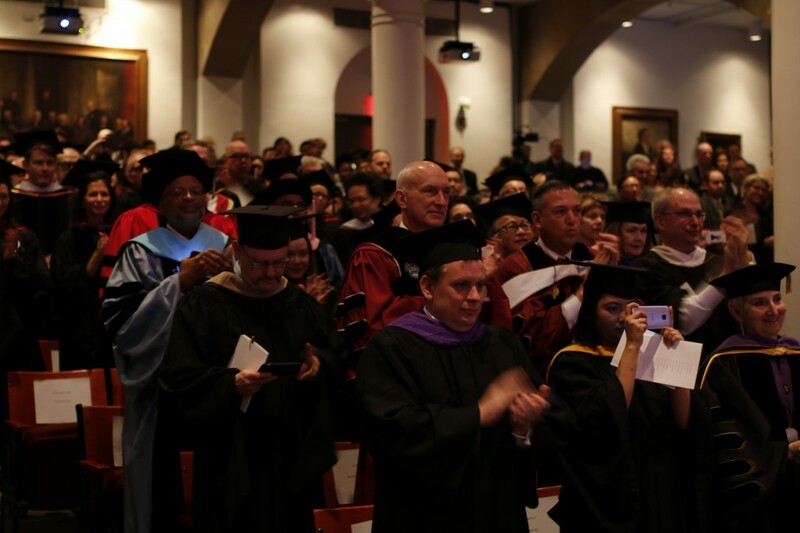 He reminded us that victory is not guaranteed and that no single moment could save Cooper Union from financial turmoil, and the only thing to do everyday is get up and fight. He reminded us that the FEC plan to return Cooper to free tuition in 10 years is unlikely, but a step in the right direction. Warren congratulates newly-inaugurated President Sparks. Photo by Wentao Zhang (ChE ’19). 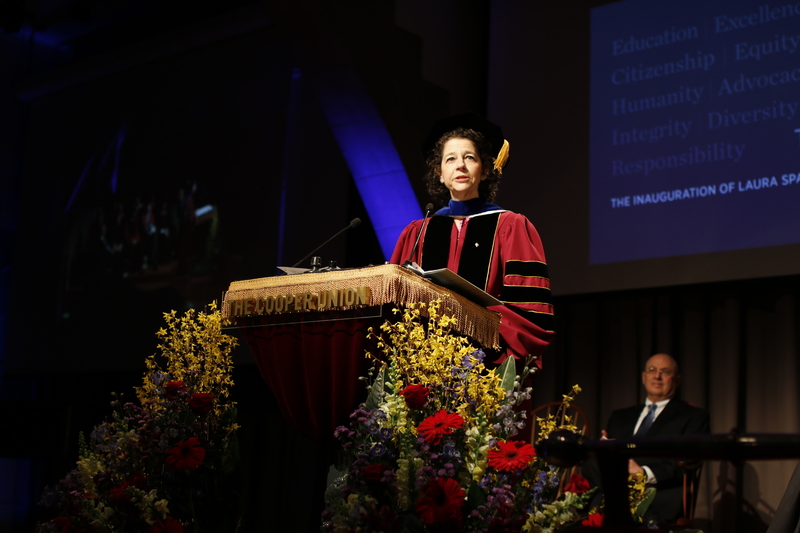 Sparks was inaugurated shortly thereafter and delivered a speech on her ambitions and hopes for Cooper Union. 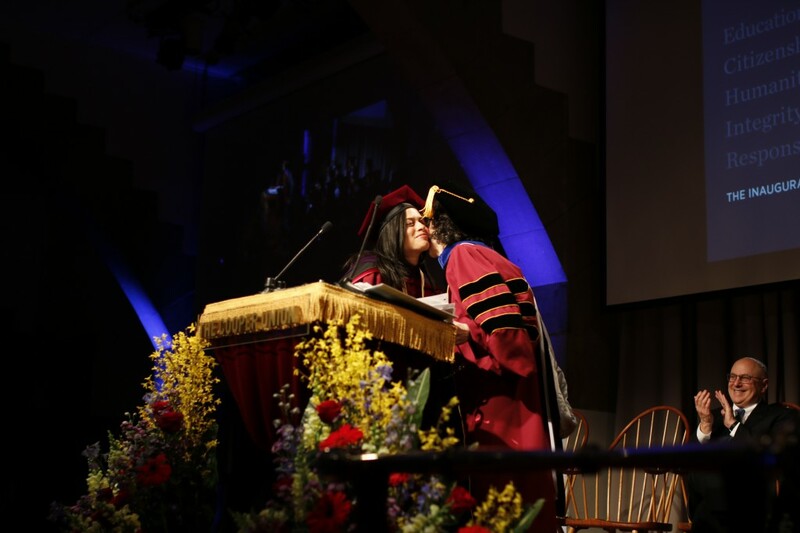 Of these, Sparks mentioned her goals of continuing Cooper Union’s academic excellence, increasing outreach, and continuing the diversity that Cooper has to offer. She stated how Cooper Union has always been a place for movements and a place for leaders’ voices to be found. She officially announced that Cooper has received $8 million through a challenge grant by the estate of a 1945 Cooper graduate, and another $2 million from the IDC Foundation. 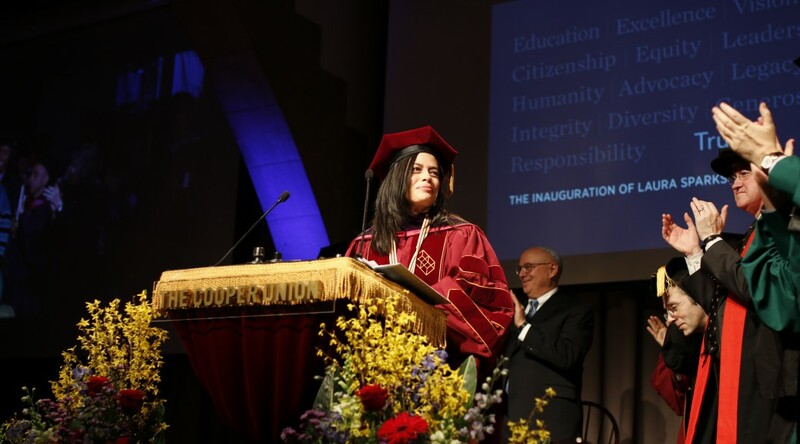 The full inauguration can be viewed on the official Cooper Union YouTube channel: youtube.com/thecooperunion.